Loads of FUN Themed Questions for Yes or No Answers. This is a FAVOURITE for many of our LITTLIES. Great for Guided Reading and literacy groups. Many of the questions are quite ‘funny’ and the children love this ‘quirkiness’. Start a ‘Yes / No’ activity box where all your question cards are placed in themed containers or plastic bags. Each group of printable reading games cards has a spare sheet at the end for you to write your own questions. Better still, make this an activity for the children. In groups, pairs, as a class, or individually- children add their own yes / no questions. 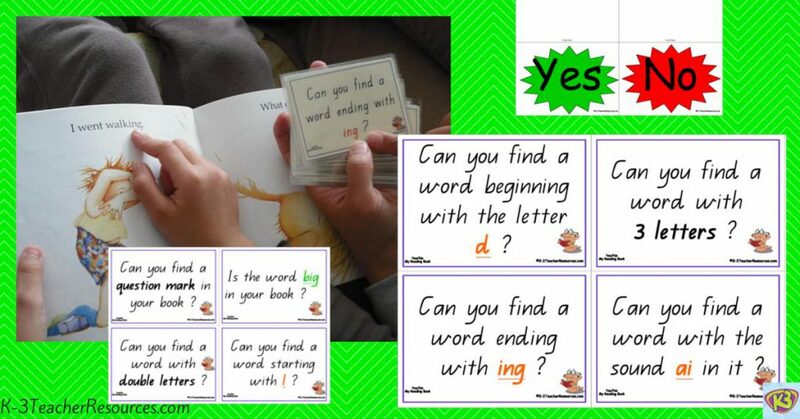 It is actually quite tricky phrasing the question so that the answer is either ‘yes’ or ‘no’ – a challenge for the children. Board game – Play a simple board game using our printable board games templates. Place the yes / no cards on the card area. Children throw the dice, pick up a card, read it and answer the question. They then move the number on the dice reading the obstacles along the way. A further variation of this – when reading the yes / no card, if their answer is ‘yes’ they can move, if it is ‘no’ they miss a turn. Maths game – Put all the cards in the middle. Decide on a certain amount of points for a ‘yes’ answer or ‘no’ answer (depending on the level of the children and the maths concepts you want to cover). For example ‘yes’ might be worth 10 points and ‘no’ 5 points. Children take turns at picking a card from the pack. They read the card, answer it and place it on their own yes or no piles. When all cards have gone from the middle, children add up their points according to how many cards of each they have.